Philippe (Francois Cluzet) is an enormously wealthy man, but his life is tainted by tragedy. His wife died young and without bearing him any children, and his subsequent involvement in paragliding resulted in an accident that left him a quadriplegic, unable to move, or feel anything, from the neck down. In middle-age he has become an observer, regarding the world from his motorised chair, a keen mind trapped inside a dead body. He needs constant care, and interviews an array of dreary candidates for the role of carer. One of these candidates is Driss (Omar Sy), a young man from a deprived background who has only attended the interview because he needs to prove he has attended three interviews each week in order to receive his benefits. Driss is a typically angry young man, pushy and rude, indifferent to society’s rules, and a shameless flirt to boot. If you were to choose anyone to take care of you, it would not be Driss. But Philippe sees something in him that he likes, and when Driss returns to Philippe’s mansion on the day after the interview to collect his signed proof of attendance, he is surprised to discover that the job is his on a trial basis. There’s an undeniable feel-good element to Olvier Nakache and Eric Toledano’s Intouchables, which is based on a true story, but there’s also a story arc that is so familiar that you can pretty much compile a checklist going in and tick each of the usual boxes as the story develops. The tentative relationship overcomes a rocky start — Driss initially balks at dressing Philippe in his support stockings and point blank refuses to go near his boss with a colostomy bag — before developing into a warm friendship. There’s a brief break-up during which both men realise they miss the way they used to be before a feel-good reunion that pretty much returns us to the point at which the film began. In this respect The Intouchables is not unlike 95per cent of screen romances you’ve ever seen. Except this one, of course, is a Bromance. The feel-good factor is largely down to the hugely likeable performance of Omar Sy who manages to soften Driss’s hard edges enough to prevent him from being the kind of sociopath you’d expect a character who’s done time for robbery to be. There’s an unaffected air of curiosity about him that is quite endearing, and a roguish charm that the audience, like those around him in the film, will find impossible to resist. It’s just as well that Sy is such a charismatic performer as the success of the film rests largely on his shoulders. Francois Cluzet, an immensely experienced and talented actor (who has something of Dustin Hoffman about him around the eyes and mouth), has a much harder task, given that his natural abilities are shackled by the nature of his character’s disability. He carries it off with measured sensitivity, however, and it’s a credit to him and the script that Philippe never falls back on emotional grandstanding in order to communicate the unimaginable hell he is suffering. The other characters are merely satellites orbiting these two, and the sub-plot involving Drissa’s troublesome young brother/cousin (it’s complicated) feels a little half-hearted to say the least. 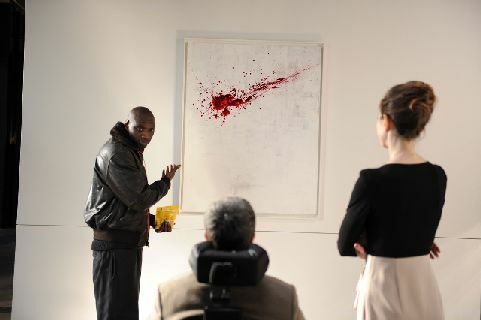 Intouchables proved to be a massive hit in France in 2011, becoming the country’s second most successful movie of all time after Bienvenue chez les ch’tis (2008). It has a lot more international appeal than that movie, and was selected as France’s official entry for Best Foreign Language Academy Award in 2013. Whether it’s good enough to win that award — or even to make the shortlist — is questionable. It reworks a well-worn story with infectious warmth and good humour, but at the end of the day there’s no disguising its well-used template.